Ta Tianjin (Sheenish: 天津; pinyin: Tiānjīn) ny balley mooar slystagh ayns twoaie Gheynphobblaght ny Sheen. T'ee ny treeoo valley smoo 'sy çheer rere eaghtyr, ny yei Shanghai as Beijing. Ta'n baljaght çhemmit liorish Hebei da'n twoaie, da'n jiass, as da'n sheear; ta Beijing da'n sheear hwoaie as Baie Bohai da'n shiar. 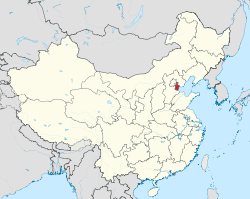 Ta tooilley coadanyn mychione Tianjin ry-gheddyn ayns Wikimedia Commons.